The indicator recognizes 15 popular candle patterns. See below for the short pattern description. 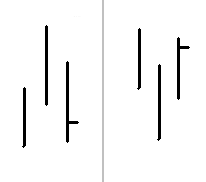 The indicator shows a short name of patterns above (below) the last candle of the pattern. To see the full name just move the mouse cursor over the pattern label and wait until a tooltip with the full name appears. The open and close prices of the bar are very close. The bar can indicate that the price is unpredictable. The bar closes at it’s highest (lowest) price. The bar can indicate that the price movement is very strong. The next bar is completely inside the previous bar. If the next bar is opposite, it could predict the change of the trend. 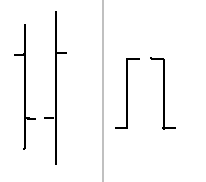 Two consecutive bars are inside bars. The double inside bar can show squeezing of the market before jump. The previous bar is completely inside the next bar. The same side next bar usually confirms the trend; the opposite next bar can predict the change of the trend. The high (low) prices are the same. 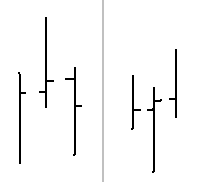 The close of the current bar is below (above) the close price of the previous bar. The stronger version of the outside bar. 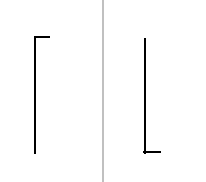 The previous bar has the highest high and low (lowest high and low) of the last three bars and the previous bar upper (lower) shadow is longer than the body. The pattern can show the change of the trend. The longer shadow of the previous bar shows the higher strength of the pattern. 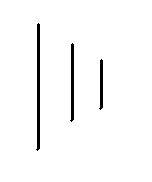 The previous bar must have highest high and low (lowest high and low) of the last three bars and the current bar must close below close (above high) of the previous bar. The pattern can predict the change of the trend. 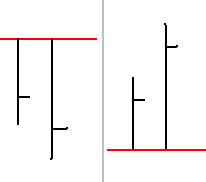 Three consecutive bars have highest high and low (lowest high and low) values. 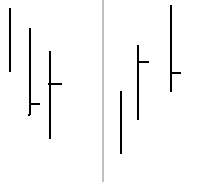 The close price of the last bar is below (above) the close price of the previous bar. 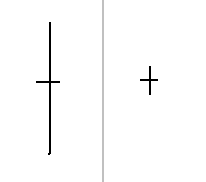 Two consequent bars are opposite bars and have the same size of the body. Up and down shadows does not matter. The pattern can indicate the end of the price correction. May you make so much money, you'll have a hard time storing it all in one country. We're really happy that our indicators are useful for our valuable users. Nice tool Will you create the same for candle chart (instead of bar chart)? This indicator work on the Bar Chart also.